From above verse of Quran, we can say that Hijab or women veiling is important in Islam and all Muslim women should wear Hijab. One of the functions of Hijab is to protect women from misdeed and harm. This particularly includes various forms of sexual abuse and harassment, which are common in societies nowadays. The Hijab sends a signal to men that the wearer is a modest and subdued woman who should not be bothered. Muslims believe that their true purpose of life is to worship the Creator Almighty Allah according to His instructions, as revealed in the Holy Book Quran and through the teachings of Muhammad (SAW), the last Prophet of Islam. Modest clothing is an essential aspect of worship in Islam as well just like other forms of worship. Muslim women are ordered by Allah to wear Hijab and veils. Covering the beauty of a woman is for her honor and protection rather than abolishment. Virtues of Hijab can be judged by Quranic verses as women veiling is mentioned in Quran clearly. From above Ayah, we can conclude that Hijab is purity and the heart will become more pure with wearing Hijab as it protects from evil actions and thoughts. Hijab and women veiling are not meant for restriction somewhat it is a means in which Muslim society may function in an appropriate manner. Islam protects and safeguards the individuals and the society from awkward situations. So while wearing Hijab, Muslim Women protected and also safeguarded from evil deeds and thoughts. Hijab gives the women an air of authority, dignity, and respect. Only those who are well behaved can expect admiration and high esteem from others. We can earn these blessings while performing good deeds for the pleasure of Almighty Allah and wearing Hijab is also one of the acts of good deeds and obedience to Allah Almighty. 1) Protects from Male Harassment: The woman who wears Hijab attracts less attention of lustful eyes than the woman walking openly. Men view the Hijab like a sign that says off limits and thus do not approach such women. Muslim women, by and large, have a low chance of being exploited for their femininity and beauty in contrast with other women who are not wearing Hijab. It shows that no other man has the right to seek pleasure from them as she is blessed for her husband only. 2) Hijab Represents Purity: The women veiling is viewed as an indication of dignity and purity. It highlights Muslim women as subdued and pure women. Actually, the Hijab acts like a screen between modest Muslim women and the world’s evil. By wearing hijab a woman feels safe and protected. 3) Wearing Hijab eliminates competition amongst women: The hijab cuts down on competition among women. In Islam, Women are appreciated for their knowledge, piety, and contribution to society. When women wear hijab one finds that the most beautiful women are not necessarily the most popular. Rather, a woman is assessed for her mind, and not just superficial physical traits. By wearing hijab, Muslim women can go about their normal duties without worrying about impressing other people. 4) Women veiling places focus on intellect: Hijab benefits Muslim women by forcing people, particularly men, to focus on the women’s intellect. Comparatively assessing woman for her mind, while the society usually appraises her based on physical traits, not her intellect. 5) Hijab increased self-esteem: Women veiling in Islam kind of prevents us from buying too heavily into fashion and placing too much importance on outer appearance. We just happily wear as we believe that Allah Almighty has instructed and get on with life. 6) Hygienic Purposes: All public should wear Hijab or head-covering workers serving society to ensure cleanliness and purity. Workers in a number of professions wear “veils” – nurses, fast food workers, restaurant workers and servers, doctors, health care providers and many more. So we can say Hijab has so many social benefits that we can get with pleasing Almighty Allah. We can earn blessings from Allah in both worlds in this life and hereafter too. 1) Wearing Hijab protects the heat from the body being lost. Medical tests show that 40-60% heat is lost through the head so wearing a head covering in cold months is very important from the health perspective. 2) A head covering is very important for hygienic purpose too as mentioned above all public should wear Hijab or head-covering workers serving society to ensure cleanliness and purity. Workers in a number of professions wear “veils” – nurses, fast food workers, restaurant workers and servers, doctors, health care providers and many more. 3) Keep your hair pollution free when you cover your head. 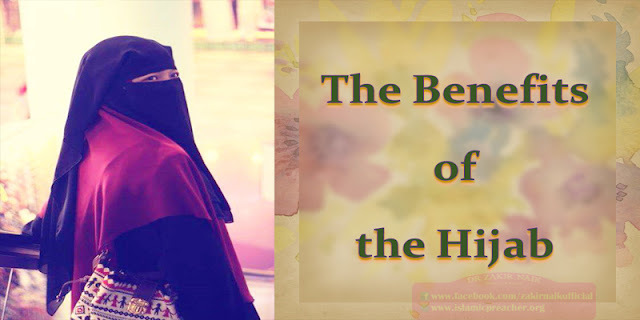 Hijab protects the hair from dust and direct exposure to sunlight that may damage the hair. 4) Keeping most of your skin shielded from the sun’s harmful rays the most of the time, preserves your bodies largest organ and keeps it wrinkle free for much longer while wearing hijab and covering the face. Wearing Hijab does not have demerits and those who wear it have more strength and confidence. We as Muslim women should make a practice to wear hijab so that we can obey the Almighty Allah and can earn blessings from Him in both worlds. Women who wear Hijab Almighty Allah give them respect as well as keep them pious and free from any disturbance.